I have garnished this dish with some coriander leaves in above picture, but in the original dish, coriander is not used. Heat oil and fry garlic cloves. Add green chillies, one cup of water and turmeric. Boil for 5 min. 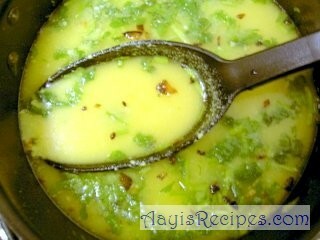 Remove from flame & add this to buttermilk. Add salt. Had a query, Garlic should be chopped well or just like tht have to fry it in oil…. Shilpa: You can do it any way. Just make sure to remove the outer skin while frying garlic, otherwise it pops up. wifey loves chaaas (butter milk) …. this wud be a great variety from the conventional ones .. When I got a free time I used to check the recipes in internet. because I am very much intersted in cooking. I never had found this type of site before.I like so much this site,because most of the recipes are simple one and u had given as very simple by giving step by step photos.I looked almost all of the receipes.Tomorrow we will have guests will prepare Gopi manjoori and Fried Rice as per your recipe.And I like varity of iddlies will try it in next weak,and will try the stuffed porata,stuffed vegetable,paneer roast,different types of cakes. Thank you so much such innovative recipes. Hi! i think u forgot to mention what happens to green chillies?? r they fried also along with garlic or added alongwith turmeric to the water ?? I have been looking at your Buttermilk Gravy recipe (yum) and found this one also. But When do the chillies go in? With the turmeric, or afterwards with the buttermilk? I never drank or liked buttermilk…but i tried this recipe n since then i have started loving buttermilk……Thanks alot..all ur recipes are jus awesome..